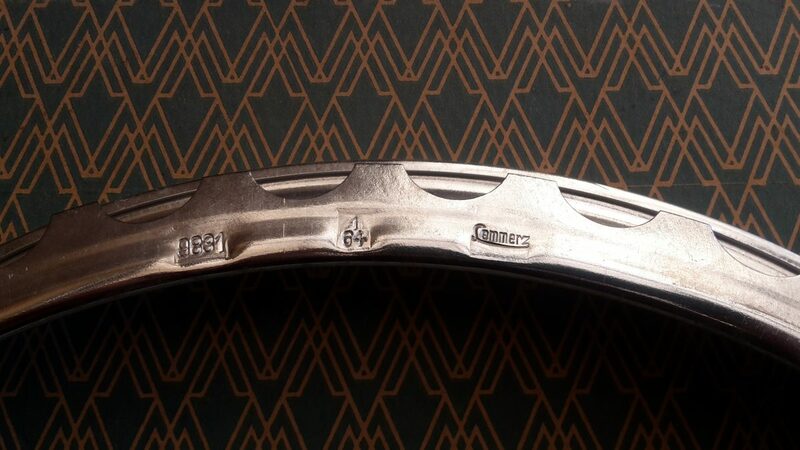 the Samba didn´t had its original 16” wheels anymore when it was found last May. 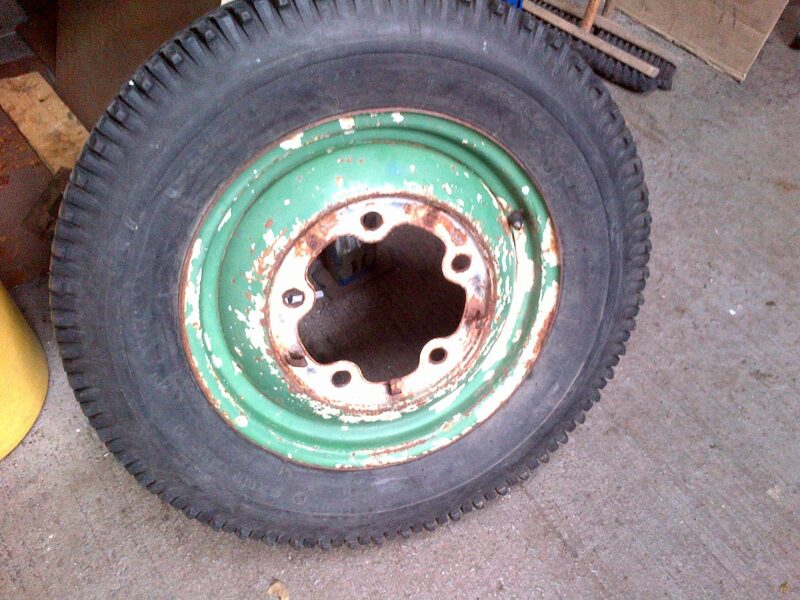 So I had to search a set of Barndoor wheels, what is not the easiest task -and it´s pretty expensive too. But wheels you can mount still last minute during a restoration process, so I didn´t feel too much pressure to pay sky rocket rarity prices for Barndoor wheels when thinking of the years this reconstruction will still need anyway. I decided to buy this wheels only when they cross my way for small money. 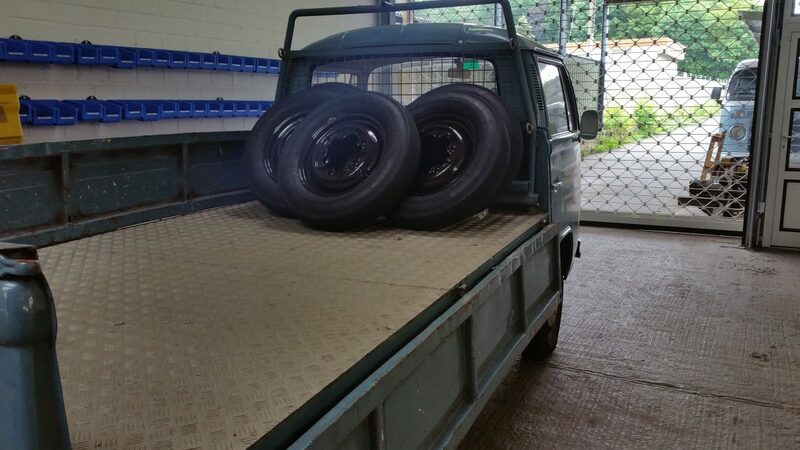 So I bought two wheels in Hessisch, two in Spa and the last one came to me the best way of all: a neighbor showed up in my place and donated a “very poor, old 5-stud-16”-wheel, maybe you can use it”. I was happy enough it wasn´t just an ordinary 16” bug wheel, but a Barndoor one. Bingo! 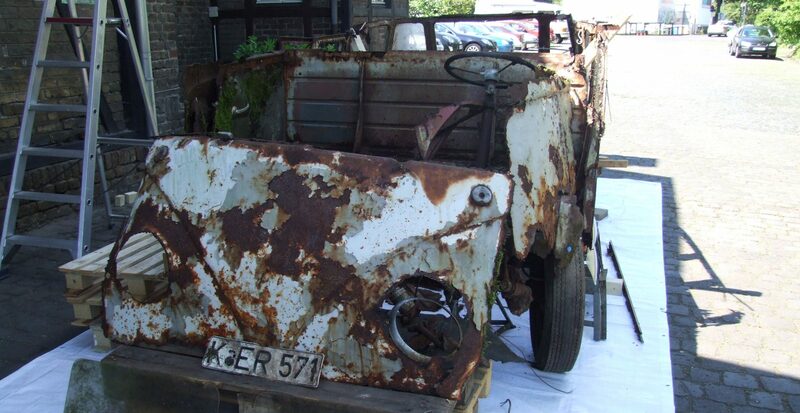 Looks like junk for most people, but it´s a rare Barndoor wheel in fact. And made locally too! Next step was painting the wheels. Finding the correct color combination for 5×205 Volkswagen wheels is kind of scientific. Most of them are painted with a sophisticated two tone scheme which correspondents to the color of the car, but never one of the two wheel colors is the same as the car´s color itself. Believe it or not, the factory had a team of psychologists just for creating the best color combinations. This effort reached its peak in the early 60s when even the beetle´s steering wheels, running board mats and fender beadings had their specific colors. So I was kind of feared about finding the right colors for my Samba´s wheels. How wrong I was! 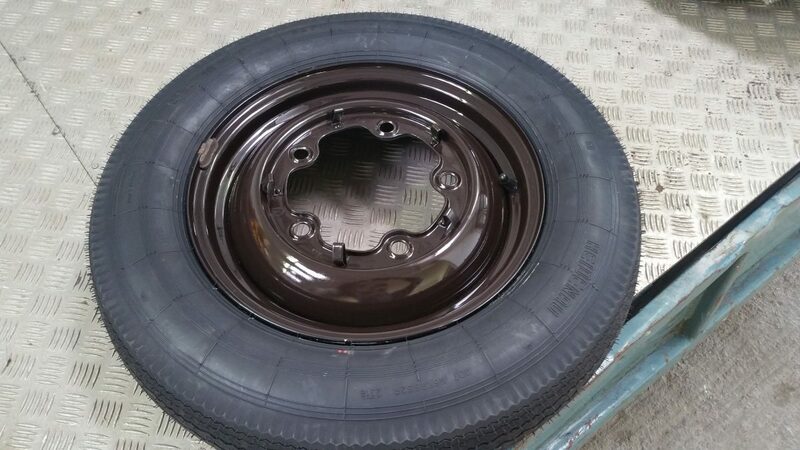 The question of the Barndoor Samba wheel color is very easy to answer: the majority of the Sambas came in sealing wax red / chestnut brown and these Samba´s wheels were painted just in plain chestnut brown. “Why”, you may ask, “did Volkswagen paint the wheels of its top range car this basic way?” Well, the factory added to the Samba wheels a very special touch of luxury, something only Sambas came with factory wise: a set of chromed beauty rings for the outer wheel rim. Looks as a typical early VW two tone wheel at first glance, but it´s something much more special. Just as the entire Samba is. No need to say that most of this beauty rings got lost during the life of a Samba. This makes these rings very, very rare today anyway. To make it worse the rings are specific to the wheel size too, of course! 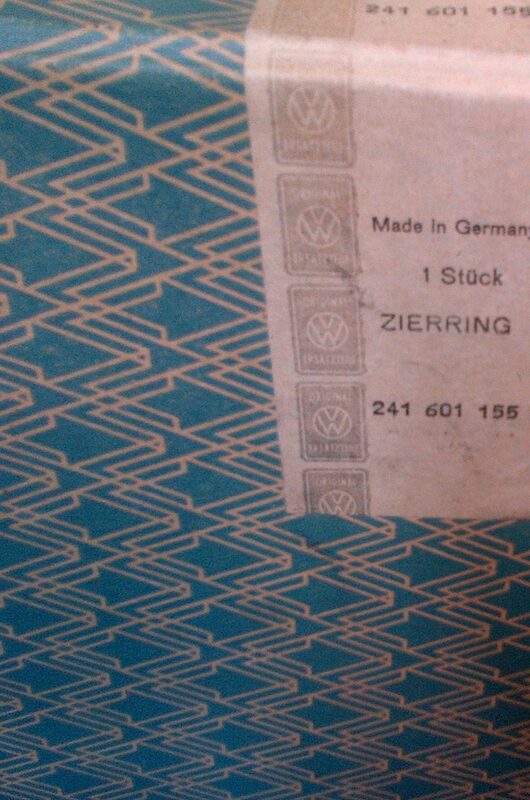 Now think about the fact that Volkswagen changed from 16” to 15” wheels already in 1955 and then to 14” in 1963. Can you imagine how rare Barndoor Samba beauty rings are today? I was lucky enough to find one NOS beauty ring in my own stock. And now guess who was the manufacturer of this beauty rings? It was also Lemmerz! OK, it might need some years until I find the missing three remaining beauty rings, but this is no reason to wait with the paint job. Also finding the correct tires is a job which I could do right now. 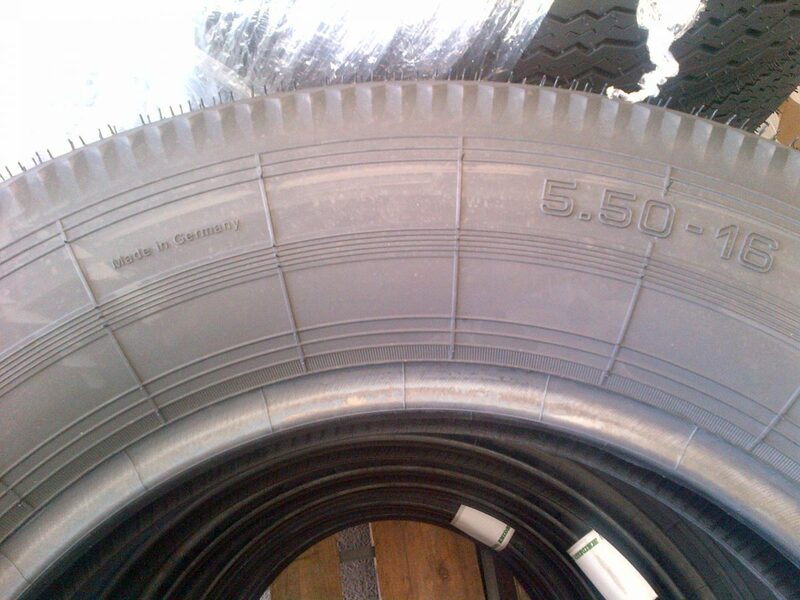 I was not in the mood for a set of this ugly tires produced by the well known names today. These tires´ look doesn´t have too much in common with the original Continental tires which the Barndoor Samba showed after leaving the Wolfsburg factory. But finding old production tools is my profession, so why not trying to find an old German production tool for 5.50 -16 tires? To make a long story short: I was successful finding this tool. Not the Contiental one, but at least a German one. 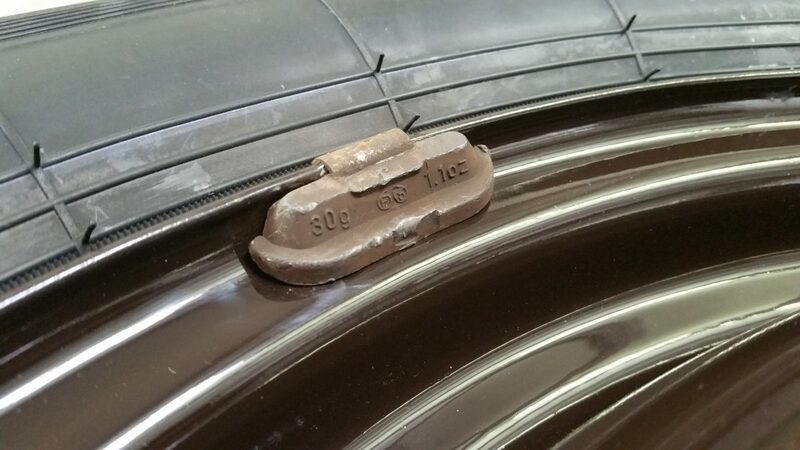 I could also convince this certain tire company to produce a small series of these tires on the old tool. Take a look at the design. Not too bad, don´t you think so? 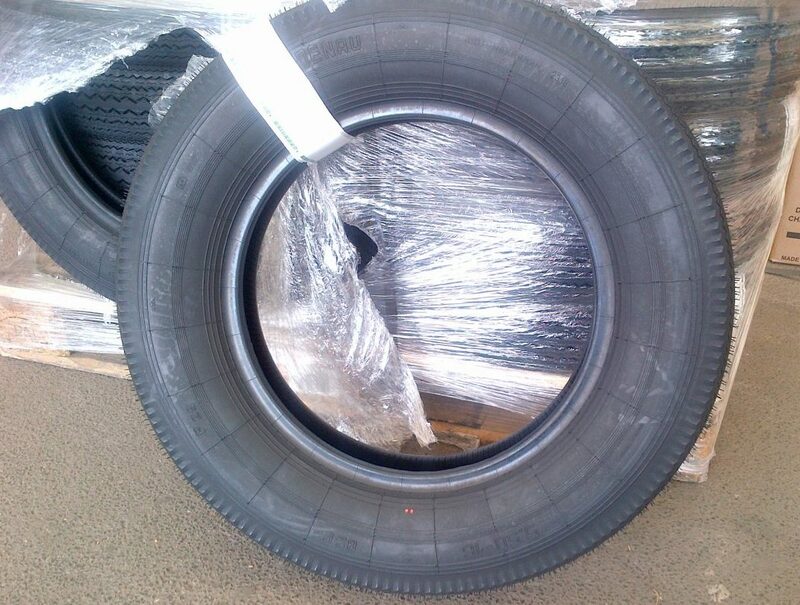 If you own a Barndoor too which is in the need of a tire set, I produced enough of them! Just give your local VEWIB-distributor a call. Here come my freshly mounted tires! Cool, isn´t it? To add another touch of originality, we used vintage plumb balance weights. Another job well done. Time for an after job summer refreshment, especially in the summer time. I hate sports, but I am smart enough to know that some sports is essential when you turn 50 and want to stay in good condition for continuing a punk rock life with lots of vintage Riesling and lots of vintage Volkswagen activity. So let´s go to a local public swimming pool. Could there be any other place matching more perfectly then this one here? No kidding! 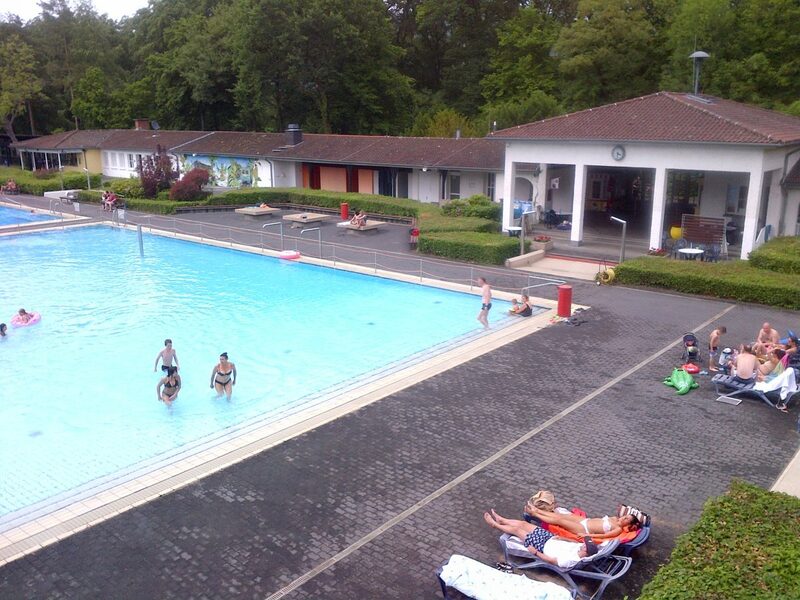 This place is the public Lemmerz swimming pool in Königswinter! There was not to much changed since the pool opened its doors in 1953! 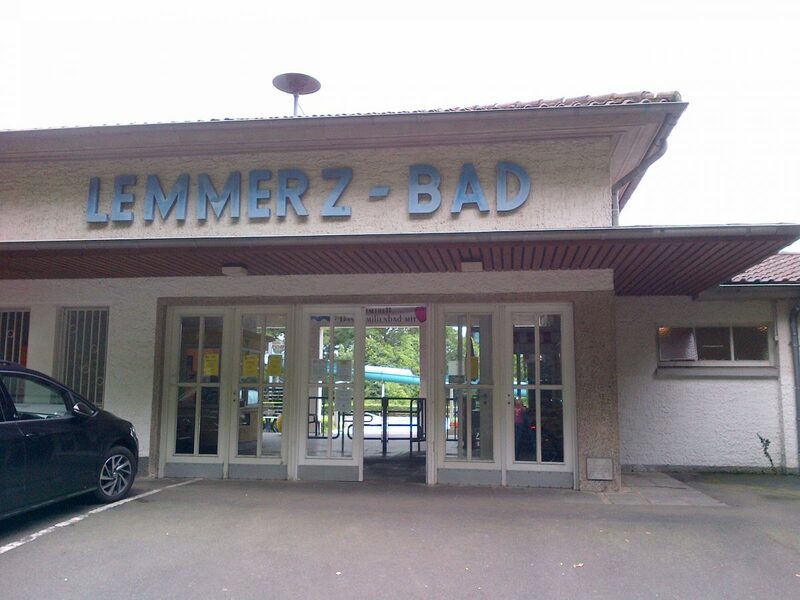 Coming back to Lemmerz, it´s time to tell the story of the factory´s owner, Mr. Paul Lemmerz. Lemmerz was always big in producing steel wheels and the factory is still producing wheels today, but lorry ones only. Already in the early 50s Lemmerz was very successful, not at least cause of the big amount of wheels he produced for Wolfsburg. Paul Lemmerz made so much money, that he felt the need of sharing some of his fortune with his hometown Königswinter. He was just 51 when he decided to donate Königswinter an entire open air public swimming pool! What a cool dude he must have been. Still today you can go in the summer to Paul´s pool and it´s an amazing experience. If you love the styling of vintage Volkswagens you will fall in love with this place right away, cause it still looks as it was 1953! There was not too much changed, this yard is a time machine. 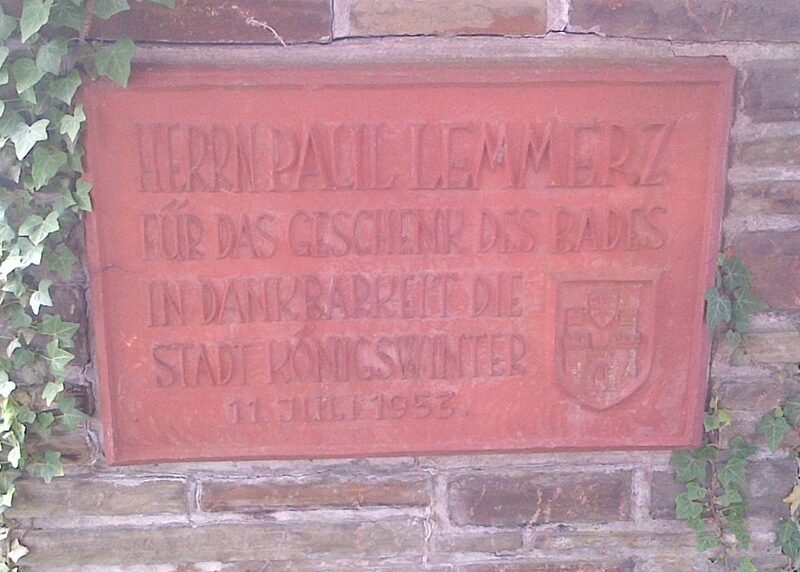 In 1977 Paul Lemmerz donated another public swimming pool to Königswinter town, but this time an indoor one, also still existing. How rich and how generous he must have been. Unfortunately Paul died right after the opening of the second pool. He is buried in a fancy mausoleum at the public Königswinter graveyard. So next time you come to the Rhine area with your vintage Volkswagen, have a little brake at Königswinter and honor Paul´s life with a visit of his swimming pool and / or his grave. Both is pretty impressive. ⟵See the Samba driving in Bonn next Tuesday! Very nice tires and wheels!! And thank you for the great story!